The Breeze---as she sits in the boneyard. Hey All, I've around for quite a while but haven't been able to get pictures over here. I decided come hell or high water I was going to successfully attempt it one more time. With MALKIERE'S instructions to RUBY ROTTEN off I went. Didn't get the results I should have gotten on the very first step....great. So I kept farting around and as I am looking at a picture of the ol girl I can only hope y'all can too. I'm quitting right here to "submit" and see how I did. If successful I will continue on with Clint & I's journey of creating what will soon be "Our Home". You got it my man. Keep them pics rolling! We bought her back in October of 2012. She was in the movie "Firelight" with Cuba Gooding Jr. Here's a picture of how she looked when we saw her. 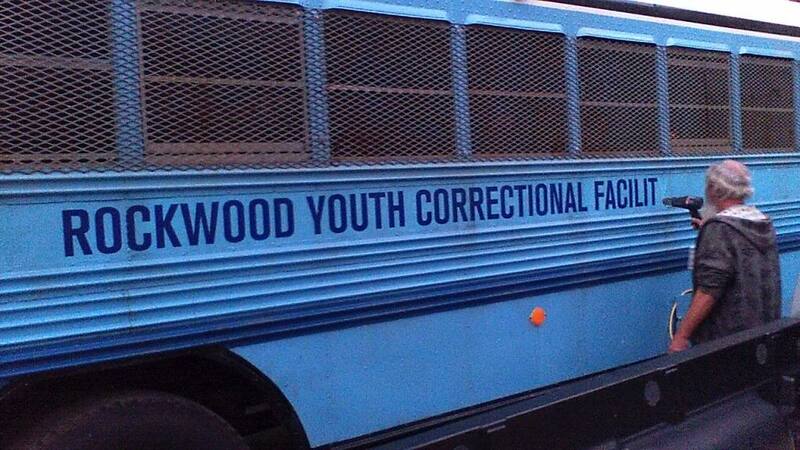 She's all decked out with sealed off back door and bars on the windows and a gate to keep the "inmates in, from the Correctional Facility"
...and yes that is me after our first night at the first Annual Skoolie Meet in TN. 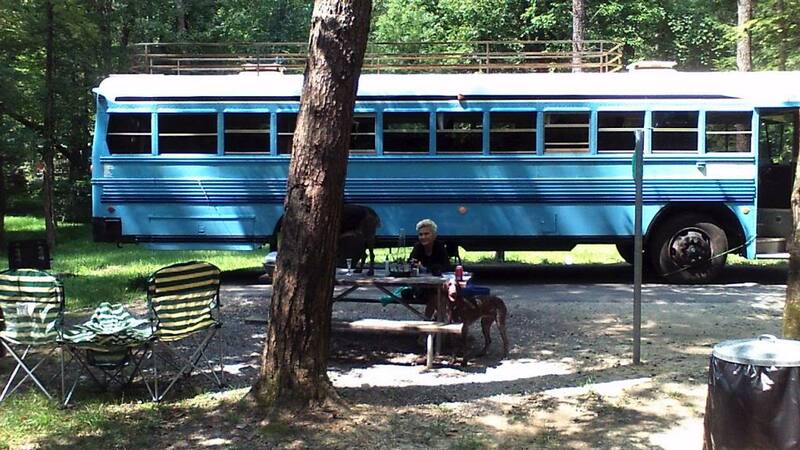 Skoolie meet in TN? When and where was it? Last August we met up with a few peeps from here. I think Grey Eagle has all the pictures. We tried to get a 2nd Skoolie Rally going for this year...but for some reason everything just fizzled out, too bad had a good time. As we hadn't gotten far in our conversion I said we would be there even if we had to sleep on the floor, keep our beer in a cooler and **** in a bucket. It came close to that, but worth the trip. We got to meet GreyEagle, Ghostrider and Travelingwithus. We also met ????? (I never did really get his name) from Georgia. cool bus! does your horse bite? I like your bus. Can't wait to see what you do with it. I noticed that you have a roof railing on top. Make sure you seal all those fasteners well. Skoolie Met in TN??? I wished I'd known. I'd come for sure. I don't live all that far from you. We lucked out with her. With Clint under the bus breaking the bolts and me inside holding the heads, each and every bolt came out without incident. 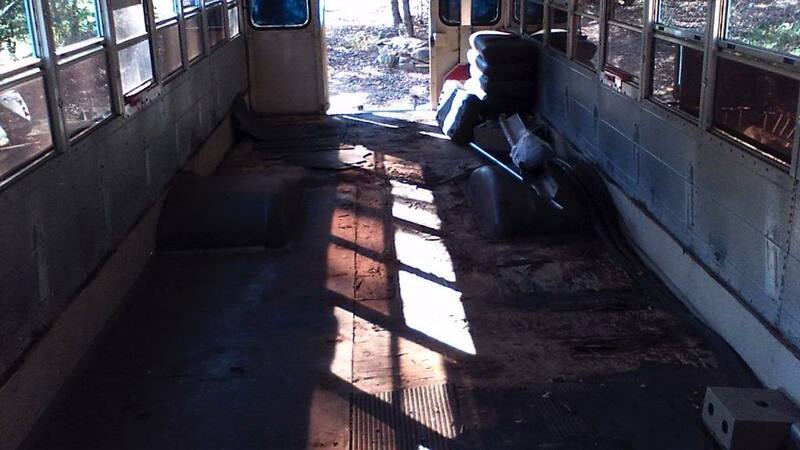 With fingers crossed, we removed the matting and the rotted wood floor. The metal floor had a few tiny rusty spots, none completely rusted through. Clint took the sander and ground off all the rust and we applied a rust inhibitor. We can't remember the name, got it at Home Depot. I suppose they are all pretty much the same. I got a gallon of primer from my favorite store "THE RESTORE" (all sales go towards Habitat for Humanity) for $6.00. I had splurged and ordered a 5 gallon package of HY-TECH and added the required amount to the primer and covered the whole floor. I then added more HYTECH to a gallon of oil based KILZ (another $6.00 find at my fav store) and covered the flooring with that. The plywood is 3/8 inch. We were going for 1/2" but when Clint mentioned our bus conversion to a Customer of his, he was offered "as much as we needed of the 3/8th for free. The price was right so 3/8 is working fine on the floor. I plan on putting a coat of KILZ down and painting the floor once we got everything installed. As plans for the inside go, they have changed and changed and changed some more. Doesn't everyone's? All I knew from my original plan was that I DID NOT WANT A STRAIGHT PATH FROM THE FRONT OF THE BUS TO THE REAR. I designed my kitchen to be off to one side so you had to swerve around it to get to the rear. I wanted to typical horseshoe triangle of sink, stove & fridge. One day at the RESTORE we came across an island that was for sale for $70.00. 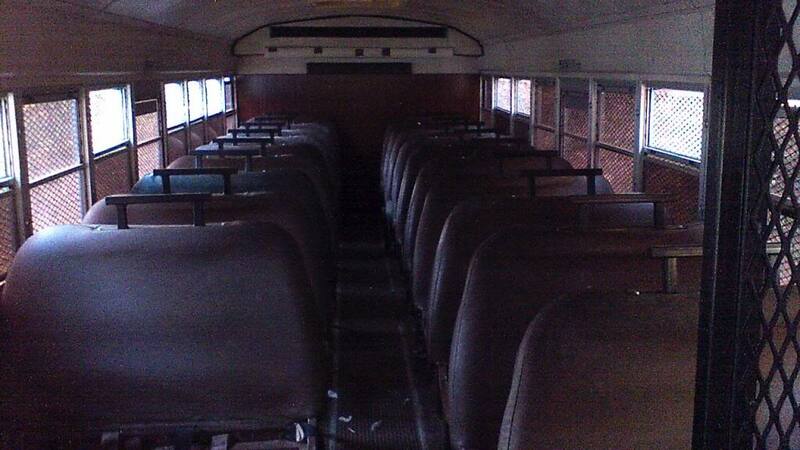 Once in the bus it seemed to take over the whole kitchen....I loved it, I hated it. I loved the fact that it has 6 slide out shelved and doors. That was all. I about abandoned the horseshoe design but because this island was sooooooo huge and wide . I struggled and swung it around so it went from side to side as I didn't want the beauty of the details to be hidden up against the wall. Even though it's 24" deep & 46" long. I already had planned to paint everything, walls, cabinets and whatever else wasn't moving a light grey and I felt "kind of bad" painting it but I did it anyway. The left drawer has been taken out and we dropped in a stainless steel sink (another $5.00 find from the RESTORE). 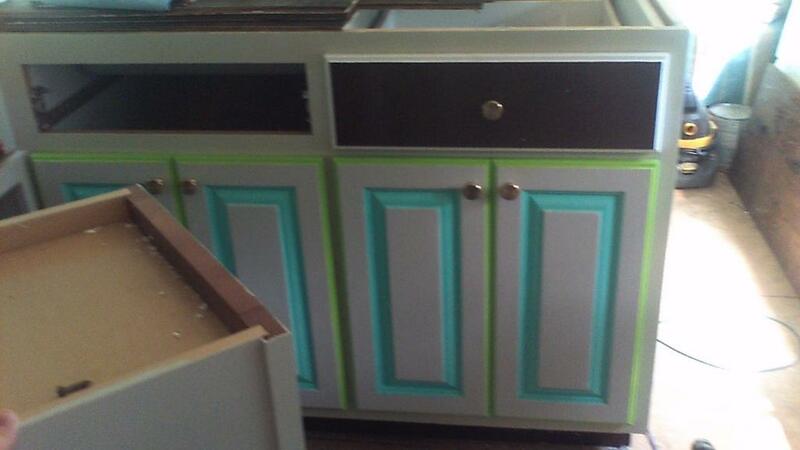 I took the front off the drawer and painted it to match the right one and we will be hinging it and putting it back on to hide a small area for dish sponges and such. The color and design is the same all around. What you see in the front will be our "dining area". Ah, give me time, it'll look better, I promise. Anyone want to help us pick out which chairs to keep? 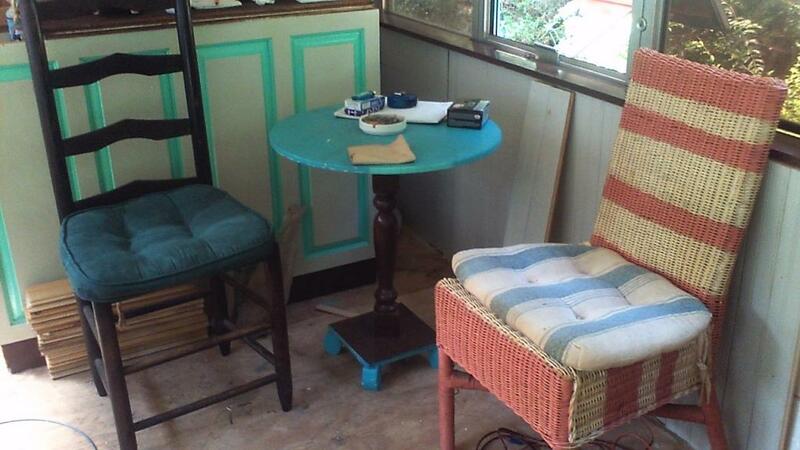 The wicker chair is pretty comfortable and fits in with the " South Beach Hippy" look I was told I must be going for, but the high back chair is one that I had personally years ago stripped down and re-caned. I'm kind of partial to keeping a pair of them. 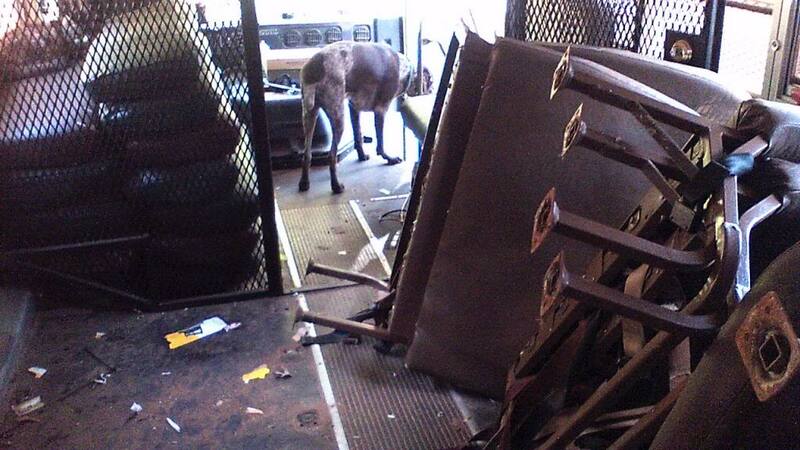 The walls, we picked up 6 sheets of 3/4 inch Styrofoam for $6.00 each and covered most of the walls with laminate flooring except the front of the bus which is wainscoating that my Mom's neighbor was scrapping and burning. Turned out we salvaged enough of that to do the living area and the crapper room walls. 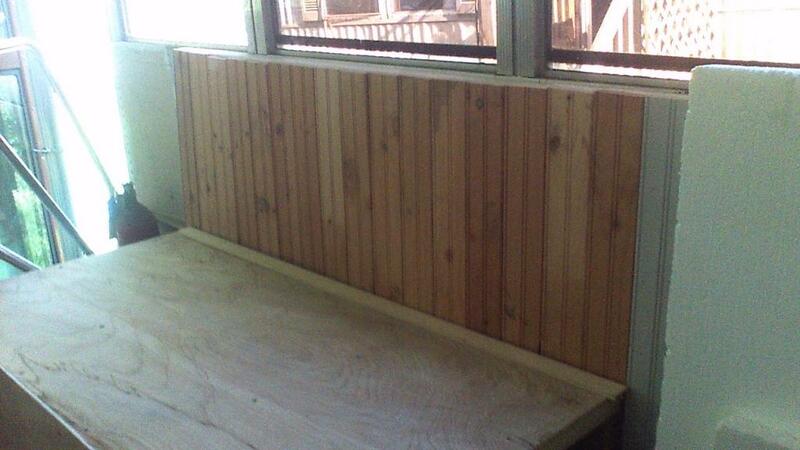 This is the supporting cabinet of Clints bed when its layed out. 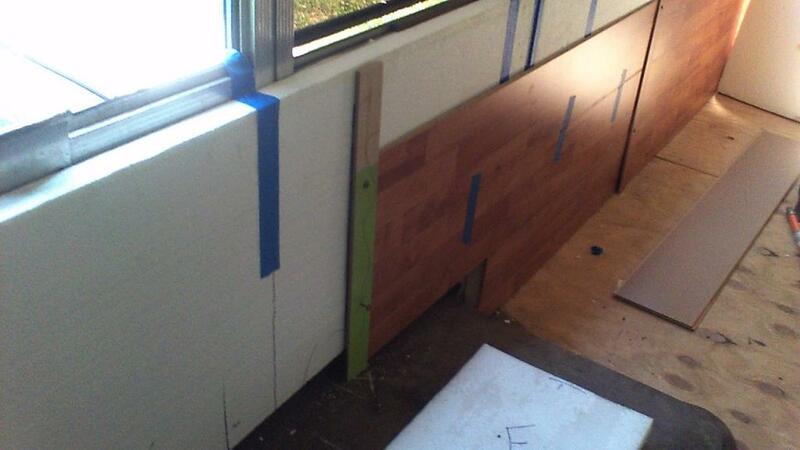 Bottom right opening is entrance to Binos crapper room, which will be completely closed in (dogs love litter boxes). Gate painted white. Bottom half will be painted brown as white & dogs don't mix. This pictures shows bed opened and sitting on cabinet. Plenty of room for dogs to walk under. Bed is 30 inches from floor with mattress on it. My bed on left will sit 20 inches from floor (so I won't have so far to fall). Dogs will be able to get to Clints bed by stepping on my bed and walking up. 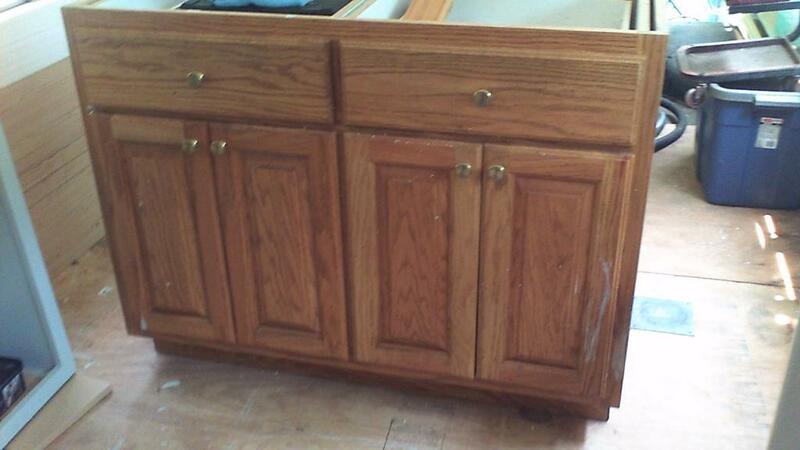 Cabinet will have door on front to keep cat out of emptying shelf for place to lay.